Rest was my word for the year, however if I were to judge myself on progress, I am failing at this rest business pretty badly. I knew it wouldn’t be easy. Sure I have read books about rest, taken a few naps, and stressed over not resting on the Sabbath, but overall not getting anywhere solid. Since March this Mama has been running nonstop, with a toddler and three olders, from one activity, commitment, home project, homeschool subject, cleaning MUST do, writing deadline, class, church obligation, leadership opportunity and family event to another. It would appear I only learn things the hard way. As a family we are together most nights, but day to day the kids and I are going from one thing to the next without any breathing room to prepare us for the hard things. Some phases are truly just going to end up that way and I have accepted that. Having a busy phase of life is not the same as having a busy life. Worst of all every single activity is a good one, undoubtedly making it feel impossible to say no. Here I am at the middle of June, facing myself in the mirror, the evidence is positively(or negatively) written all over my face. Joy has been zapped and I am not super fun to be around. Weariness abounds and there is no energy for the spontaneous. The mind is full to the brim with details, details, details. Disconnection has become the rule not the exception and my family & I are all paying for it. These are the moments you stand in the mirror and face the fact that maybe we were not meant to live this way. God doesn’t call us to be productive when it is at the expense of bringing glory to His name. We have lost sight of what rest really is and it has become a dirty word to imply we might need it. Being busy is the drug of choice for most families today rushing from one thing to another, forgoing dinner time conversations, stories before bed at night or just sitting together hanging out as a family. Don’t get me wrong either, I am all about getting kids involved in things that are good for them. It has been a joy to see them thrive in each activity they are involved in, but I cannot let it become our constant. I know I’ve never gotten that response. As I have carried on through this time I have seen on the horizon that we are headed toward a restful period as we near the middle of June. Thank you Jesus because I have been holding onto that through some weeks I am sure I cannot handle even one extra thing. 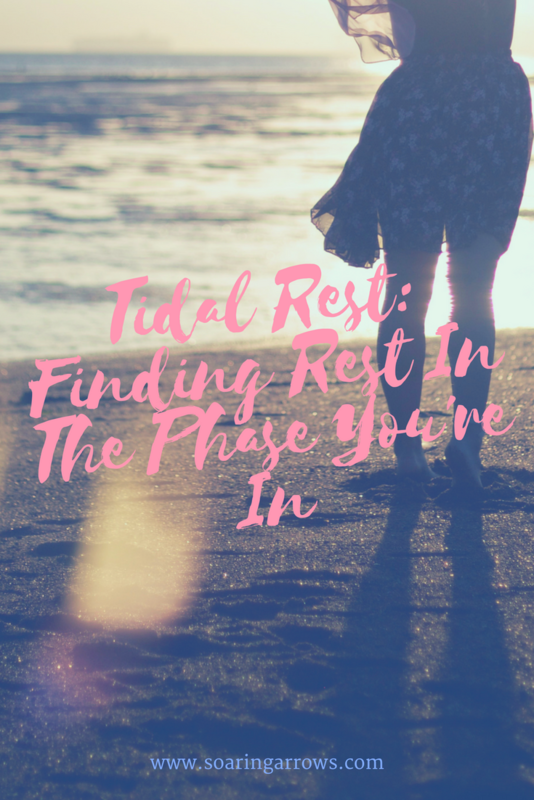 Maybe sometimes God has called us to rest & trust in Him even in an unrestful phase. Some rest comes in waves but we must grab hold of it and find solace in it while it is here. Often the tide has pulled the rushing waters back from our aching bodies but instead of resting in that moment we run towards the waves once again. As if this constant state of hurry will satisfy our families, it won’t. What our children need so desperately is to have those moments of rest right alongside us, together, as a family. God has created an ebb and flow for our lives but we must trust Him with the rushes of water in and out, back and forth. The hustle and hurry can be balanced with grace and love only if we can trust the One who controls it all. I’ve heard this verse thousands of times but never until recently did I realize how much it has to say about rest. Most importantly the fact that our strength is renewed when we wait on the Lord. In our instant gratification world we have learned to wait on nothing and achieve everything by the power of our own (un)reliable selves. What I can see here is that without God we will be weary, faint and exhausted whether old or young. That pretty much describes me right now. So now that I am at a place of accepting the tide is rushing back and God is giving me this chance to be renewed and alive in Him again, I will accept it without chasing the waves with my arms wildly reaching for more weariness. Mamas, lets just stop pretending rest makes us any less valuable when God is reaching out to offer it to us. 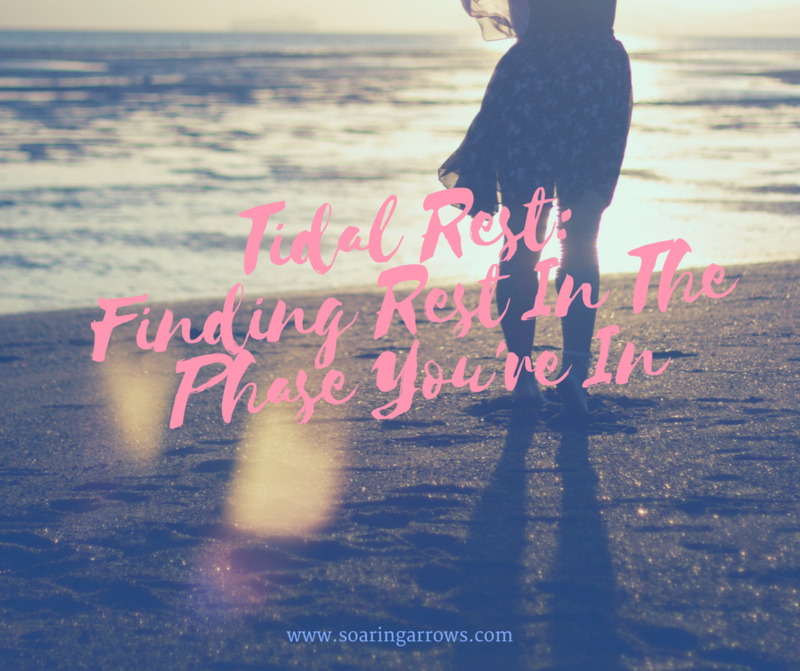 Over the next few months I will be praying about, working on and writing about 4 areas I believe God is calling most of us, especially me, to find more rest: Spiritual Rest on Sunday, Physical, Emotional and a bonus one for the homeschool Mamas, finding more rest in our Homeschool. Let’s embrace these moments when the water rushes away and we no longer feel we are drowning anymore. Stick your feet in the sand on the beach with me, a breath in and out, a long unrushed prayer, a moment of solitude before it all surely rises back up again. Previous Post Sonlight Tote Bag & Summer Readers Giveaway! I needed this today! I am excited to see how God is moving you in this area… especially rest in the area of Homeschooling! Tiffany I am so glad as well! I am working hard at slowing down right now and am looking forward to share what God is teaching me through it all.